ee Day was Friday! I hadn’t been sure about the exact arrival date, but I learned on Friday morning that Nancy had just returned to Massachusetts with the bees (from Georgia). 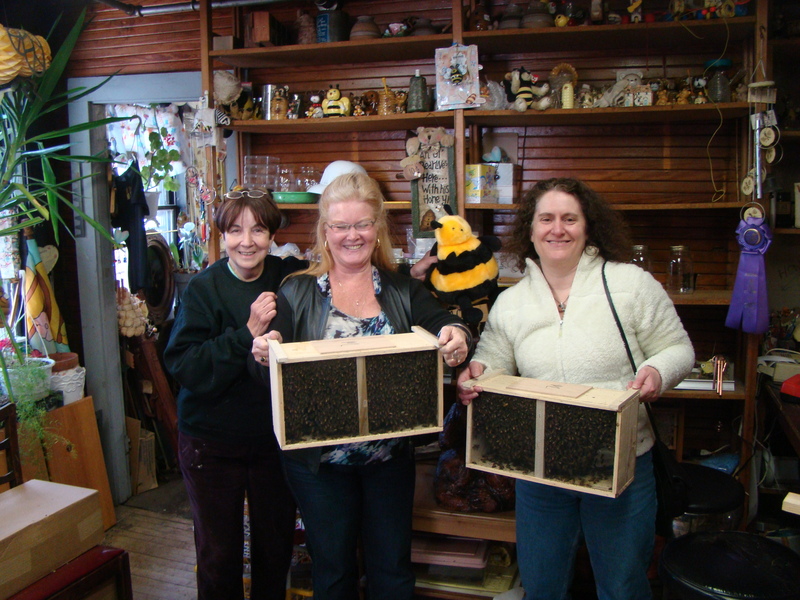 My friend Laury is also starting a hive, so we left work mid-afternoon and headed over to pick up our packages. 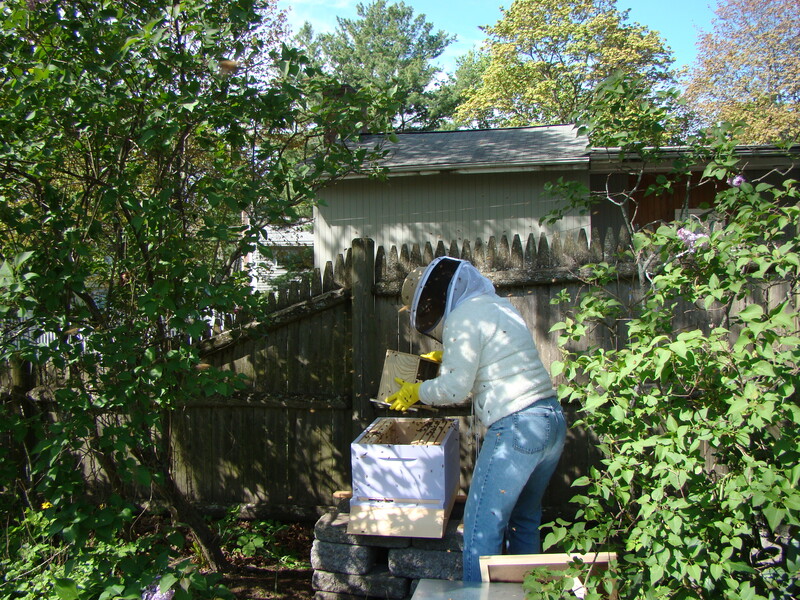 You may wonder, if you are starting a hive, how do you get the bees? They come in little wooden crate. 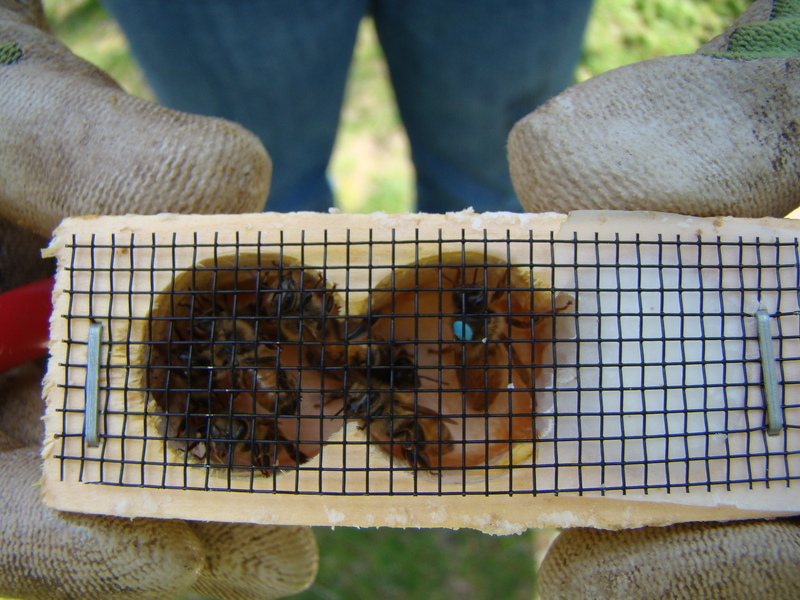 The package contains a queen, some food, and three pounds of bees, that’s about 10,000 bees. Nancy, the beekeeper providing us with bees, had about 200 of these packages in her back storeroom at the Beekeepers’ Warehouse. The first thing Laury and I did was to check out this sight. It was amazing how quiet the room was. There was a very faint hum, but it was unexpectedly soothing, rather than creepy. 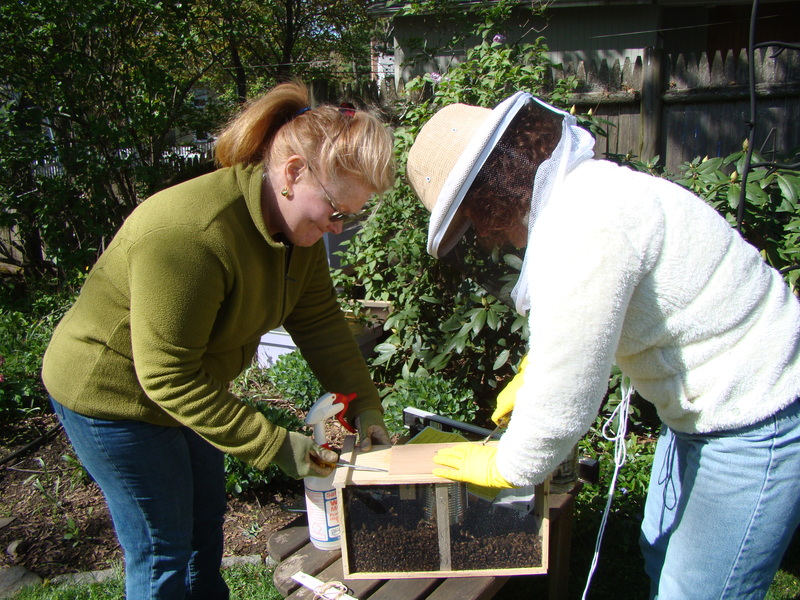 Next, we reviewed how to install the bees with Nancy. Just the idea of transfering the queen and then dumping 10,000 bees into the hive is intimidating, to say the least. Practice builds confidence. Nancy has empty equipment in her store, so we did some dry runs. 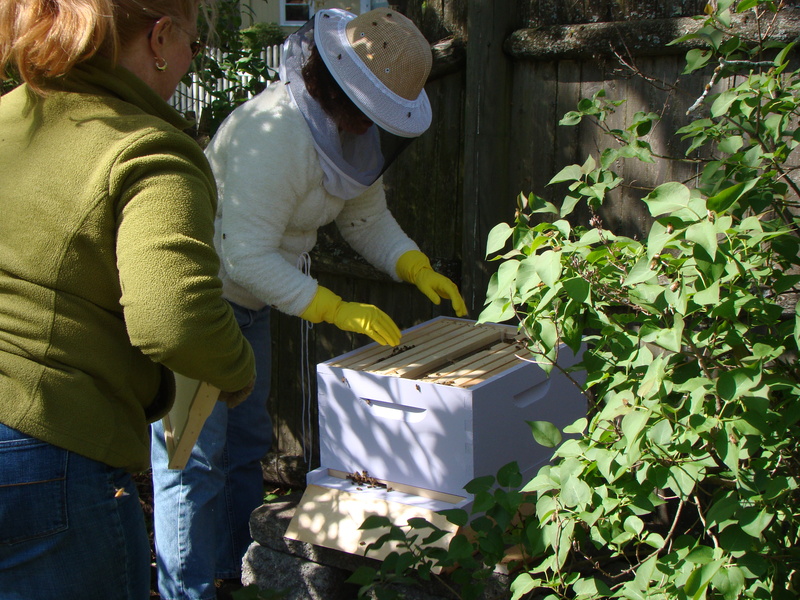 Then, we picked out our bees, and we were ready to head home. Friday evening was cold, with a frost warning, so she recommended we keep the bees in the house for the night and settle them in their new homes on Saturday morning. Laury and I had some discussion about whether to put the bees in the trunk or in the footwells behind the front seats. We were feeling comfortable, so we took them in the car with us. At home, I gave the bees some water and made them comfortable in the basement. Apparently, Laury’s spent the night on the dining room table. I think Bella would have been a little too curious for that at my house. Saturday morning, the big day! I like to be prepared, so when I woke up, I watched a video of someone installing bees. 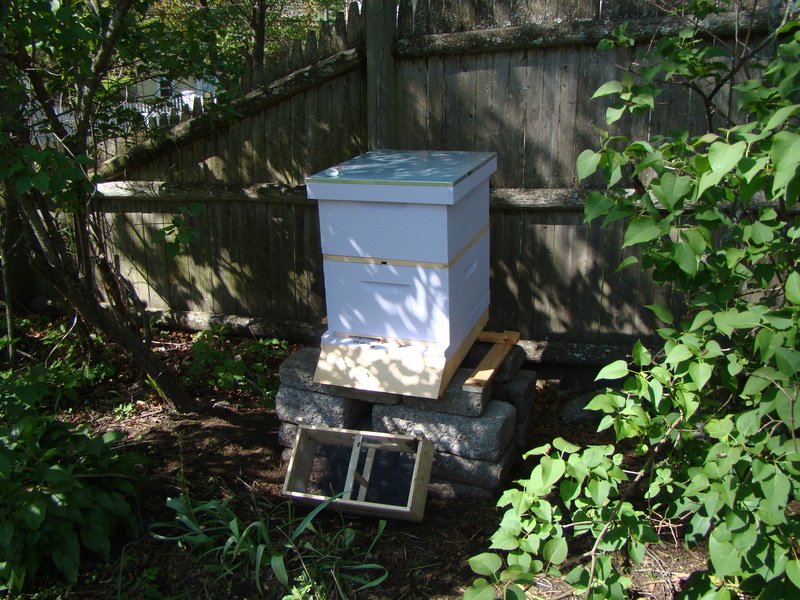 Then, Howard helped me set up the hive itself, which I had built and painted, but hadn’t yet set in place. (I added the hive stand at the last minute, so unfortunately, it’s unpainted.) 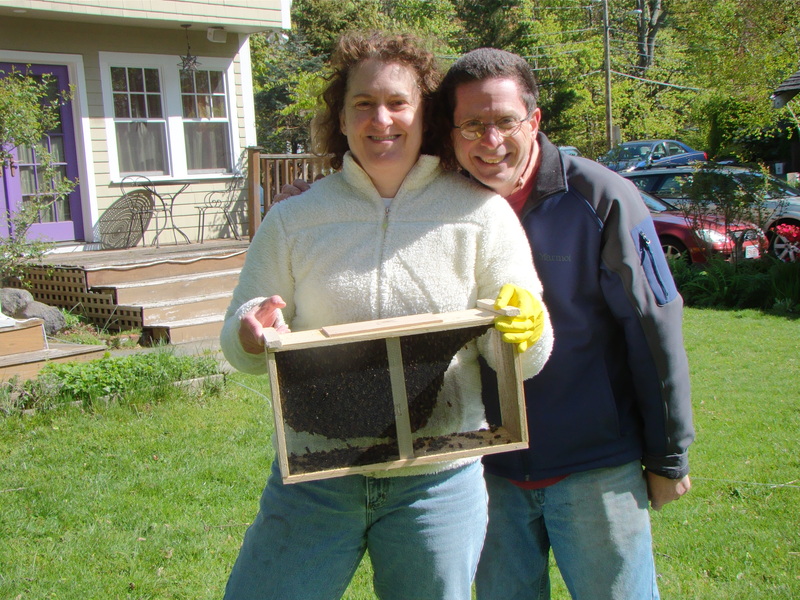 I got all the expected equipment at the ready, and when Laury came over, I brought the bees out from the basement and we got started. Laury helped tie me into the veil and hat, and I donned dishwashing gloves. Howard was designated the official photographer and caller of 911. First, we pried open the wooden box and removed the queen in her case. She’s marked with a blue dot. She has some attendants, her actual daughters, in the case with her. She’s trapped in the box with a piece of candy. The bees with eat the candy over the next few days, and she will be released. In the meantime, the bees are adapting to her pheromones so they know they belong together. I poked a hole in the candy to make it easier for the bees to break through. I attached the queen’s case to one of the frames with a big rubber band. Next, we removed the can of food from the box and covered the hole back up while preparing for the dump. 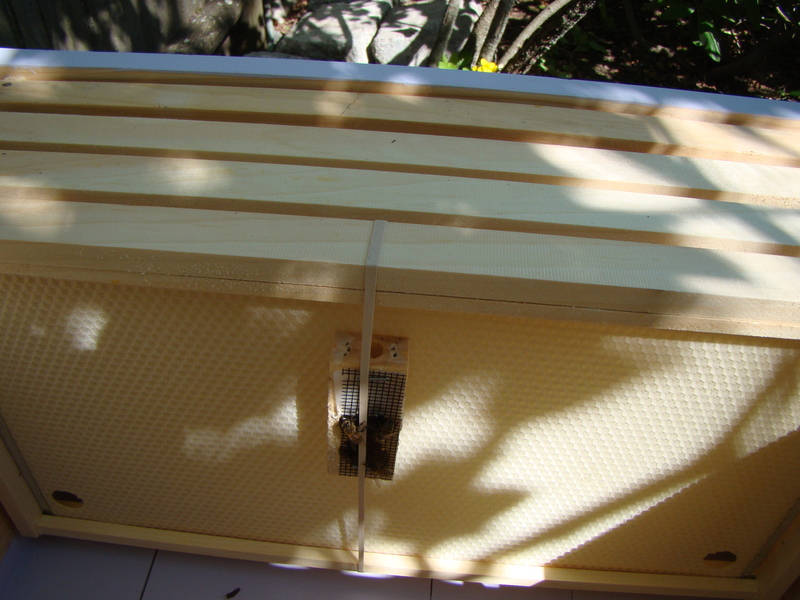 I thumped the box a few times on the ground to shake the bees to the bottom and then, in a scary moment, started pouring the bees into the hive. It took about a minute, a few extra thumps, and then they were in. Some of them started flying out and around, so I was glad to be wearing the veil for protection. I don’t think they would have stung me, but the barrier gave me more confidence. I had removed some frames from the hive to make room for the bees, so before closing it up, I had to replace the frames into the hive. 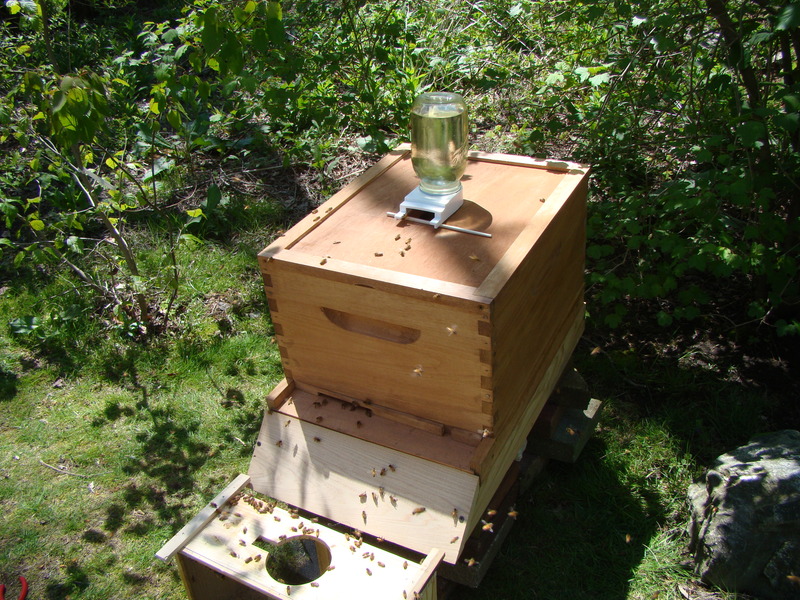 The last step was to place the feeder on top, enclose it with an empty hive body, and cover it all with the weatherproof lid. An hour later, we repeated the same process at Laury’s house. Cheers and hugs all around, our girls are home. 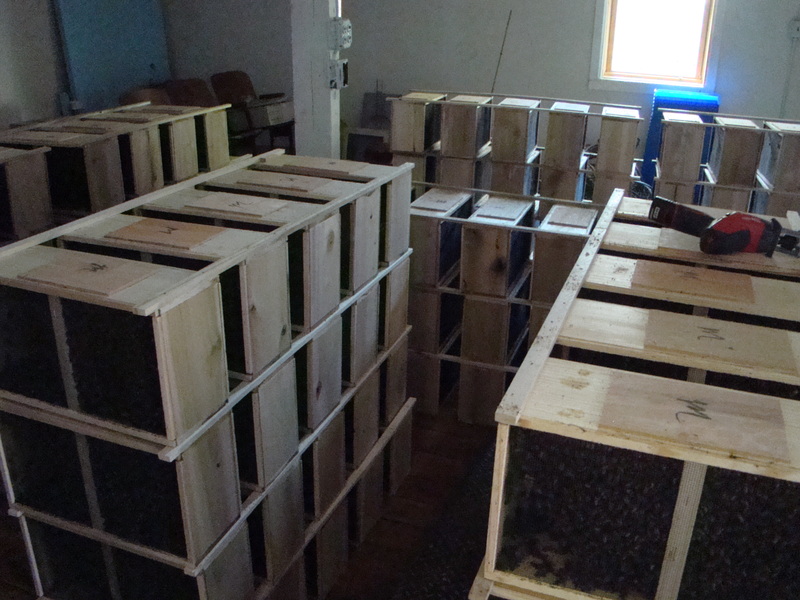 It has been fascinating to watch the hive come alive over the weekend. There is was a busy hum all day, then, at dusk, all the bees went inside and it beomes very quiet. I found myself spending time just sitting on the lawn and gazing, mesmerized, at the hive. It’s soothing rather than nerve-wracking. I’m also amazed how I was immediately comfortable with bees crawling on me. I even coaxed a few (like the ones that ended up inside the veil when I left it on the table) onto my finger to relocate them closer to the hive. For the next few days, I will leave them alone, other than checking that the feeder is filled. 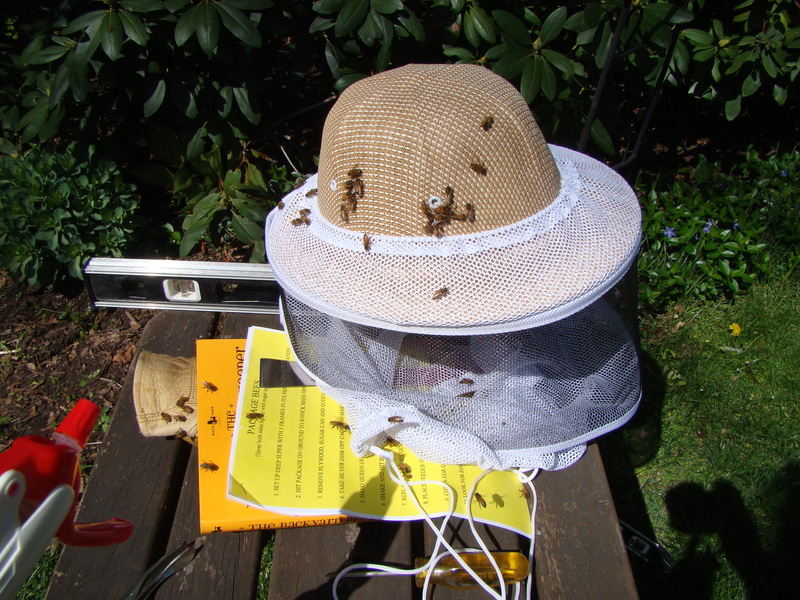 On Thursday, I will open the hive for the first time to be sure the queen has been released. 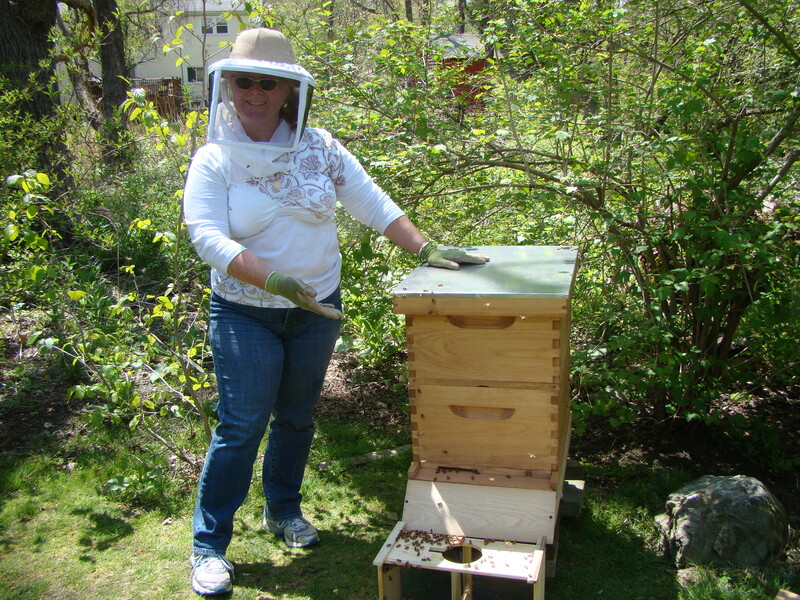 Now, I’m officially a beekeeper, and I’ve very excited about watching and helping their activities through the seasons. Note: The drop case B above was created by Jessica Hische of Daily Drop Cap. The letter is copyrighted by Jessica under the Creative Commons license. I opened the packages of lamb and wouldn’t you know they were spoiled even though the sell-by date was a week away. The smell was awful. I have never actually encountered spoiled meat before, so I was confused. I rinsed it, and even started cutting it off the bone, but it was wrong, just plain wrong. Howard came home from walking the dog and said something smelled bad as soon as he walked in the door. So, I loaded the meat into ziplock bags and we went back to the store to return it. They did give me “double my money back” for the inconvenience, but still, it was off-putting. After a quick dinner out, we stopped at the grocery store near my house (different chain) to get a new round of lamb. I can tell you there was quite a bit of sniffing the plastic before going to the register. At home, I still wanted to make this before bedtime as there’s no way I’d have enough time after work later in the week, so I set to it, with my helper Howard chopping vegetables while I boned the lamb shoulder chops for the stew. 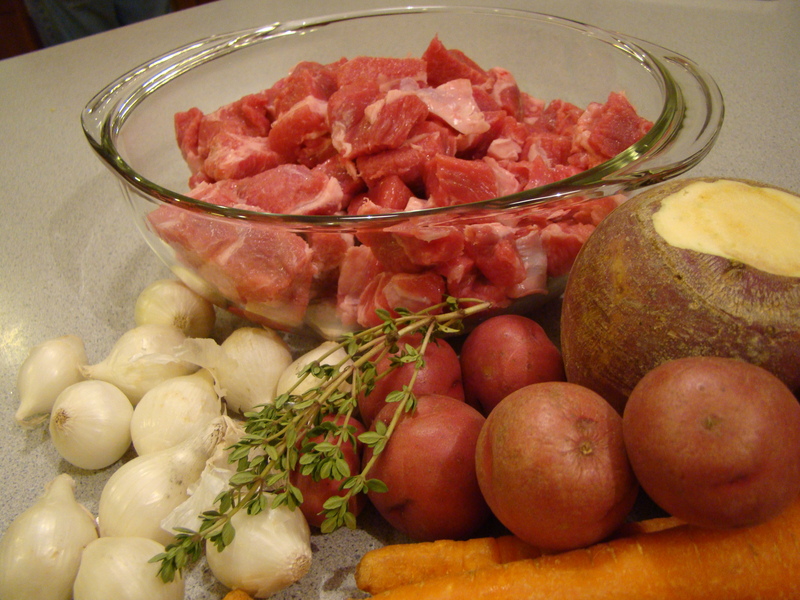 Fun fact: navet is French for turnip, so without turnips, this is not a navarin, it’s just lamb stew, or ragoût, since we’re being French here. This navarin was filled with spring vegetables: turnips, of course, baby potatoes, carrots, garlic cloves, pearl onions, peas, and herbs. I used extra potatoes and onions because I had them. Once the meat was cubed and browned, a little flour, beef broth, garlic cloves, and herbs were added to the pot which transformed into gravy while the lamb braised. 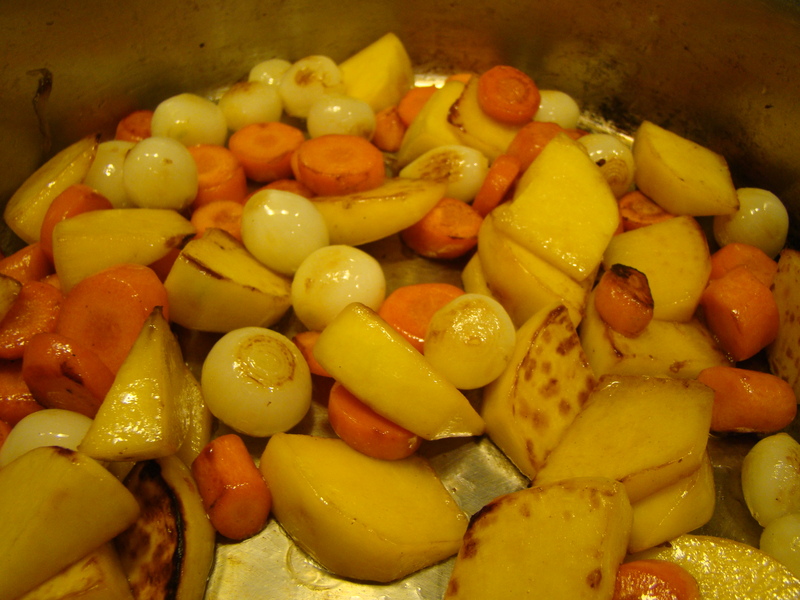 In the meantime, the chopped root vegetables were browned, then added to the lamb for melding while my navarin baked in the oven. Frozen peas were sprinkled in at the very end, giving some much needed color to this otherwise, rather brown dish. 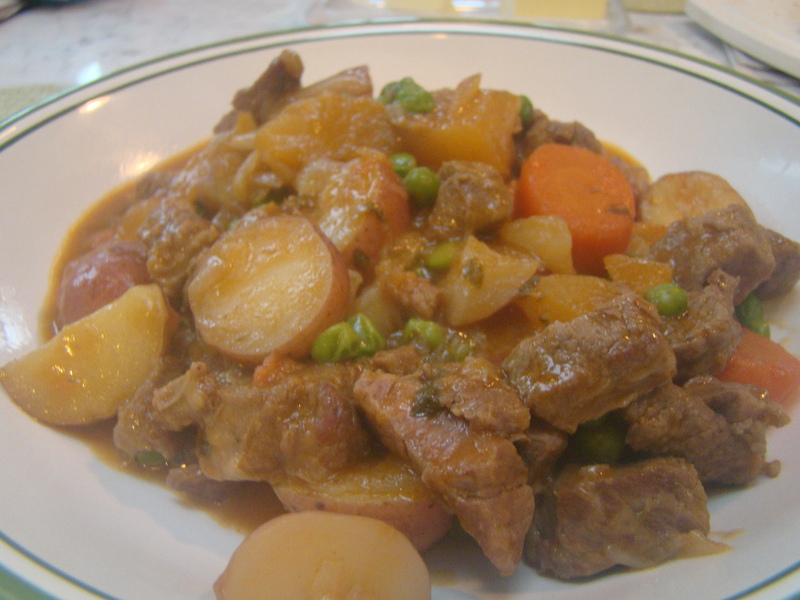 I served the navarin alone in shallow bowls. The lamb was meltingly tender, and the starchy and green vegetables rounded it out. The onions completely fell apart and must have added to the thick gravy in the pot, because I don’t remember seeing any on my spoon, and I know that I added extras. This was the perfect meal for the weather week we just had. After some unseasonable summery weather, cooler weather is back. It’s been in the 50s all week, so a warm comforting dish like this hit the spot. This is too heavy for summer eating, but I will definitely make navarin again when fall comes back around using winter squash and maybe some mushrooms. I know that April has been a challenging month for many of the participants in French Fridays with Dorie. The main ingredients in so many recipes were ones that people have strong feelings about, one way or the other: sardines, coconut, and lamb. The coconut was challenging for me, but I found a way to participate, and yet, not, for that one. Onward to May, which looks to be a smoother road for all. You can read about the other Doristas’ navarins here. For the recipe, you’ll have to look at the Dorie Greenspan’s book Around My French Table. Maybe you’ll even want to cook along with us on Fridays.